January 21, 2008. Nobody promotes ancient superstitions as if they were enlightenment insights like Oprah Winfrey and her medical mandarin Dr. Mehmet Oz. This time the pair promotes ancient Chinese superstitions about energy healing. (According to Wikipedia, Oz is married to an energy healer, a practitioner of Reiki.) Oz, the product of a modern medical school (the University of Pennsylvania School of Medicine), confidently proclaims that "acupuncture has been around for 2,500 years in China" and "there are a billion people in another part of the world who use these therapies." He could say the same about belief in ghosts and a number of other Chinese superstitions that have been around for thousands of years. I wonder what Dr. Oz would say about this list of forty Chinese superstitions. A billion people believe that some numbers are lucky and some are unlucky. They believe the same about colors. They've had these beliefs and many others like them for thousands of years. So what? The fact that an idea is old or that lots of people accept it doesn't make it true. We can tolerate magical thinking among the intolerably poor and uneducated, but it's disgraceful for an educated adult dressed in surgical scrubs to use his authority to promote rubbish. 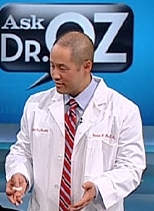 Oz directs the Heart Assist Device Program and is a founder of the Complementary Medicine Program at New York-Presbyterian Hospital. So, why does he wear scrubs when he appears on television in Chicago? Didn't he have time to change after his last surgery or is he trying to impress us? It's not just about acupuncture, the man in scrubs says. "The reason I'm so excited and passionate about alternative medicine is … [because it is] the globalization of medicine." Right. It might be more accurate to call it the globalization of superstition. "We're beginning now to understand things that we know in our hearts are true but we could never measure," he says. "As we get better at understanding how little we know about the body, we begin to realize that the next big frontier … in medicine is energy medicine. It's not the mechanistic part of the joints moving. It's not the chemistry of our body. It's understanding for the first time how energy influences how we feel. "* What? Those Chinese needlers who started this woo-woo didn't understand what they were doing? That's an insult, Dr. Oz. It's also an insult to suggest that those working on the cutting edge of medicine today are as backward in their thinking as you are. What's wrong with this guy? Does he really believe that we should revert to the ways of medicine men who developed their ideas and techniques in complete ignorance of anatomy and physiology? He may be a fine surgeon, but I wouldn't let him near me with any sharp objects in his hands. How can a medical doctor go on national television and declare that the next frontier in medicine is to go back two and a half millennia, and be applauded for it? Only on Oprah. Of course, the proof is in the pudding. Why bother with scientific studies when we can do a demonstration on television that should convince even the greatest skeptic? So Oprah brings on a volunteer, a lovely lady by the name of Angela who says she's been suffering from shoulder pain for a long time. That baseline is good enough for frontier medicine. "She's seen doctors, had X-rays and tried massage, but nothing has worked," we're told. We may have insulted all those massage therapists in the audience who think their woo-woo is as old and as popular as acupuncture, but at least now we're getting the details we need to do some real frontier science. When all else fails, why not try acupuncture? Then again, why assume the goal should be to remove the pain? Maybe her body is trying to tell her something. If she removes the pain, she might act in ways that could prove harmful to her shoulder. Anyway, Angela is given a free acupuncture treatment, whether she needs it or not. Lo and behold she says: "I'm on cloud nine. I feel rejuvenated. The pain that I had was a constant radiating pain, and I don't feel it. Literally, I don't feel it. I feel wonderful." Huzzah! It's a freaking miracle! This ancient wisdom really works. Wait. Her acupuncturist, Daniel (wearing a white lab coat and looking very clinical), says she needs a few more sessions. But she says she doesn't feel any pain. Why more sessions? "The key is to have a few treatments back-to-back-to-back so it builds up on itself," Daniel says. "Eventually she'll have no pain at all." Okay. I'm sure that's all been worked out by the frontier scientists in their clinical trials. But I'm concerned that maybe she's elated by the exotic treatment she's just received and is just eager to please Oprah, Daniel, Oz and the millions of people watching her. Maybe she's not going to be on cloud nine forever. Maybe the feeling of rejuvenation will be temporary. That's covered. You have to come back for more treatments. Hey, but maybe this pain would have gone away on its own over time. The frontier healers are banking on it. Maybe not in Angela's case, but in enough cases to have a log book of satisfied customers. So, how does this work? The acupuncturist sticks needles into determined points on the body. These points were not arrived at by any knowledge of the body, however. They were identified independently of any knowledge of anatomy or physiology. The traditional belief is that the needles unblock chi flowing along meridians. The unclogging of chi allegedly restores a balance to yin and yang. That's Chinese energy medicine in a nutshell. In Reiki, the energy medicine practiced by Oz's wife, the healer uses her hands to channel the energy of the universe so the person can begin healing. Surprisingly, though, Oz doesn't mention chi or energy or yin or yang when he explains what's going on. Why not? I thought this was the new frontier of energy medicine. No, says Dr. Oz, the needles stimulate endorphins and serotonin in your brain—natural chemicals that regulate pleasure and mood. Who knew? The ancient Chinese sure didn't. They developed all this mumbo jumbo about energy, meridians, yin and yang, before they ever dissected a human body. They had no idea how the body works. Anyway, Oz is misleading us...again. Scientific studies on acupuncture have been done where people are not actually stuck with needles (though they might think they have been stuck) and it has been found that the opioid system gets a kick start whether you get stuck with a needle or not. How can that be? It's called the placebo effect, but Oz, like many others, may think that it can't be a placebo because it's not in the patient's mind. It's in her body that the effect is felt and measured. The fact is that it is well known that placebos and nocebos have physiological effects. Another thing scientists have found is that these physiological effects brought about by placebos occur under certain circumstances and are not as powerful as, say, actual pain-killing drugs. When you have a patient whose expectations and desires are favorable to suggestion about the effectiveness of the treatment and a healer who presents himself in an authoritative and hopeful way, you can stick needles in the patient's ear or give her a vial of water (but call it a homeopathic remedy) with instructions to take two drops before and after every meal, and if she doesn't disbelieve, you'll likely end up with another satisfied customer. Why? We don't really know why. But we do know that the needles aren't necessary to stimulate the opioid system. If the needles did stimulate the production of endorphins and serotonin, why would this necessarily be a good thing? Might there not be harmful side effects? How can you be sure that when you turn on the opioid spigot it will go off at just the point where you feel better and won't take you to heights or depths you couldn't imagine? Sticking needles into the body is not natural. But it's the brain's own chemicals that are being stimulated, says Oz. It's the brain's own chemicals that can lead to depression or bipolar disorder or schizophrenia. Just because the brain is producing the chemicals and they're "natural" doesn't mean they're always going to be beneficial. Will Angela's pain go away forever? Who knows? Do you think Daniel's going to give her free treatments? Well, maybe. After all, she is pretty cute. Do you think Oprah or Oz will do a follow-up and see how she's doing several months from now? I don't either. Frontier medicine doesn't work that way. Following up on miracle cures is too messy, especially if done off-camera. It's best just to collect anecdotes from satisfied customers and pass them off as scientific data. The good news, however, is that you don't need to have pain like Angela to benefit from acupuncture. Oprah had a few needles stuck into her as part of a "wellness acupuncture treatment" that will "boost her immune system," whatever that means. She takes Daniel and Oz's word for it that this would be a good thing. * Let's hope it doesn't mean that her immune system gets so stimulated that it starts attacking her own cells. Maybe that's not allowed to happen in frontier medicine. Let's hope, for Oprah's sake, that her immune system doesn't get so stimulated that she develops rheumatoid arthritis, Type I diabetes, autoimmune hepatitis, celiac disease, Crohn's disease, ulcerative colitis, Guillain-Barré syndrome, or multiple sclerosis. A little faith is needed in frontier medicine, I guess. According to Daniel, the positive effects will be felt anywhere from 20 minutes to days afterwards. You can't get any clearer than that when you're on the cutting edge of placebo medicine, otherwise known as sCAM. But it's precise enough for Oprah, Oz, and their optimistic minions. What next, Oprah? Ear candling to remove evil spirits from your head? Moxibustion? How about faith healing? You could combine it with an interview of our new president on your new television network. You say that OWN, the Oprah Winfrey Network, will be designed to entertain, inform and inspire people to live their best lives. I don't doubt you have good intentions, but we all know where that road can lead. I suggest you balance Oz with a visit from R. Barker Bausell and discuss his Snake Oil Science, which includes a lot of material on acupuncture. Unfortunately, it's evidence-based and might not go over well with you or your audience. You might be more comfortable with a representative of the Chi Institute of Chinese Veterinary Medicine in Florida. All their customers are satisfied or they're put to sleep. update: In January 2010, Dr. Harriet Hall, the Skepdoc, started a column for O: The Oprah Magazine. She lasted about six months before she was fired. Her column, "The Health Inspector," apparently was too science-oriented and skeptical of woo-woo for the editors. As a footnote to the above article, the reader might find it amusing that I received an invitation from Tina Marconi to exchange links with her webpage that lists veterinary technician programs. Apparently, an Internet bot found my sarcastic reference to the Chi Institute of Chinese Veterinary Medicine, which led her to do some digging. The email address she sent her request to is one I don't publicize. Are you a sucker for placebo medicine?